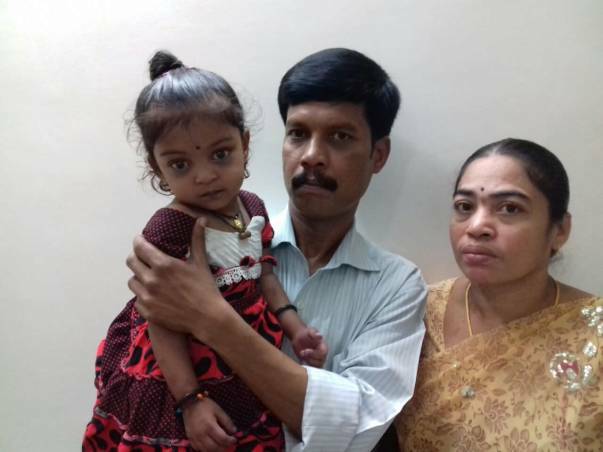 A month back, 2-year-old Manogna began showing signs of difficulty in breathing and when she was rushed to the hospital she was diagnosed with Congenital Heart Disease. 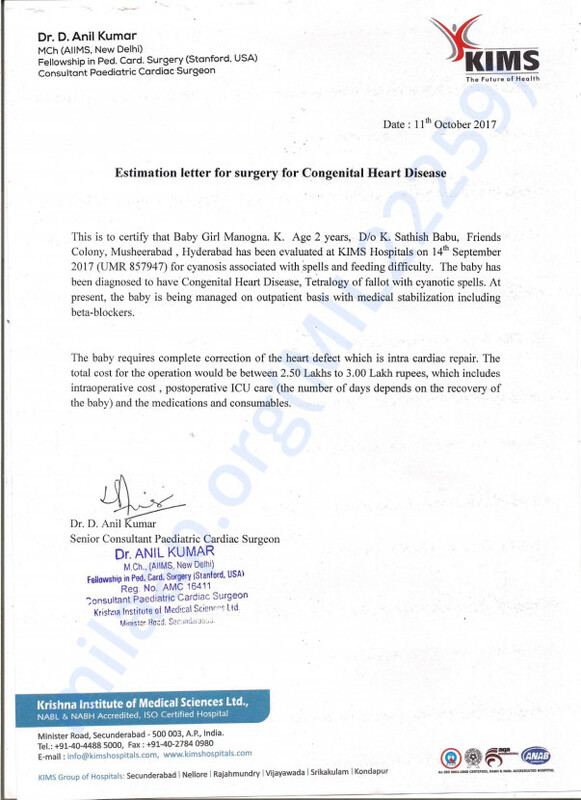 Congenital Heart Disease is a birth defect in the structure of the heart that can be life-threatening if not treated immediately. When Manogna was 1-year-old she suddenly began to have breathing trouble. She was rushed to the hospital immediately. She was diagnosed with a congenital heart disease meaning a defect in the heart structure. In her case, she has a hole in the heart.It can be life-threatening if not treated immediately. While Manogna had been put on medication immediately, the doctor has also advised for her to undergo a heart surgery in order to treat her condition completely. 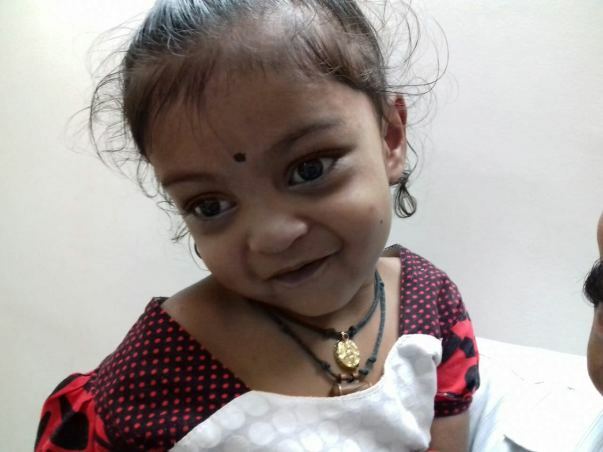 The total cost of her surgery, as well as supportive care in the ICU, amounts to 3 Lakh Rs. 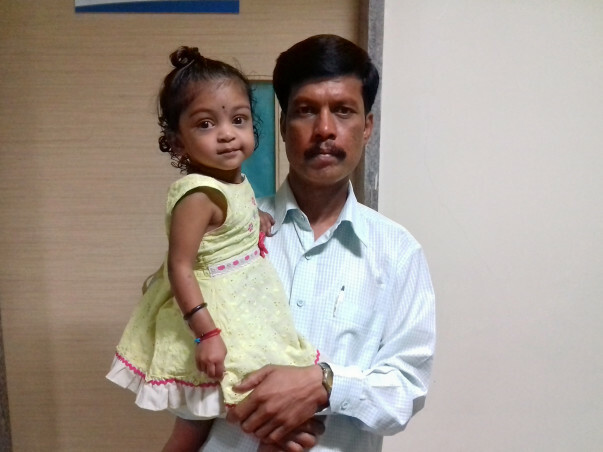 Unfortunately, her father Satish does not have the funds required to pay for her surgery. He is willing to do everything it takes to save his daughter and needs our help to save her. Her father has stopped working now to be with her. Her mother does not leave her alone for a moment. Manogna’s father works as a daily wager and earns on an average Rs7000 per month. He is the only breadwinner of the family, Now that he has stopped working there is absolutely no source of income. Left with no other options, they are struggling to raise money for her surgery. Your contribution will be used for Manogna's surgery and treatment and can save her life. Here is an update on Manogna. Manogna has successfully undergone the surgery on 14th December and is recovering slowly. She has been discharged from the hospital and is currently at home. She met the doctor this Tuesday and has to go to the hospital next week for the further checkup. Thanks all for your timely help and blessings. Please keep her in your prayers. Hope the little girl feels better soon.. Wish her a speedy recovery and good wishes for milaap for this great endaevour.